Picking up where A Celtic Childhood leaves off, Scotland is Not for the Squeamish follows Watkins from age eighteen to twenty-one. These three years are rich with maritime voyages and travels up and down Scotland's mountains and valleys. Readers will be taken in by Watkins' antics as he ducks into University classes at Aberdeen and aids in the founding of the Celtic group, Silly Wizard, in Edinburgh. And that's not the half of it. If there's something interesting, dangerous or ill-advised, Watkins is likely to find himself right in the middle of it. His account of manning a ship's radio during a disastrous storm, hearing boats going down all around him, is rife with harrowing loss and helplessness. 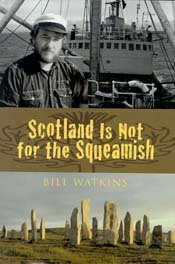 In Scotland is Not for the Squeamish, Watkins deftly mingles Celtic poetry, history, and song with true and tall tales of his high-seas adventures and explorations of the Scottish Highlands. Whether being shanghaied on a trawler to the Arctic Circle, sinking a docked warship, shooting the breeze with ghosts in a pub, bedazzling friends with Druid magic, hunting for gold in the mountains, or aiding in the founding of the super-trad , Silly Wizard, in an Edinburgh kitchen, Watkins keeps readers on their toes as he dances us through his days and nights as a young man raring to take on the world. From the "Silver City" of Aberdeen to "mystic mistress" Edinburgh to the eerie banks of Loch Ness, Watkins tackles his rugged environs with humor and smarts on this ultimate journey of maturation and self-discovery. Bill Watkins' luck at living in the carefree days of the early 70s combined with his natural gift as a shanachie, or a Celtic storyteller, makes Scotland is Not for the Squeamish a cracking good read. Sailors, Caledonophiles, traditional musicians and those appreciate ripping good yarns will all appreciate this book. The sea is rising, sending ice-floe calves buffeting along the rows of steel rivets that hold the hull plates in place. In the half-light, the distant bergs are a circle of menacing shapes. At all points of the compass, they lie like tenacious timber wolves, waiting to strike down their prey and devour it. I shiver, not so much from the cold, but from a growing feeling of foreboding that has haunted me for the past few minutes. The night descends, morbid and malignant on the Arctic Ocean, quenching the friendly flicker of the aurora borealis. To the southwest, frozen stars vanish as treacle-thick storm clouds eat into the fanciful configurations of fabled constellations. Lone sentinel of the northern wastes, our tiny vessel is a Christmas tree of colored lights in an otherwise lightless crypt of cresting swell. I give the sea one last scan, to make sure we aren't standing into any unforeseen danger, before heading for the warmth of the wheelhouse. All I see is our own navigation lights reflecting back from the glassy mountains, like the ethereal running lights of long-gone ghost ships.